In this account of a fifth grade classroom teacher embarking with her class into the world of mobile learning, three university researchers collaborated to describe her first year experience using iPads in a one-to-one setting. 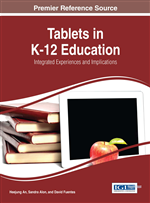 As Ms. G set out to effectively infuse mobile devices into her classroom pedagogy, the authors detail some of the key decisions that led to her successfully managing the iPads while seamlessly adjusting her classroom management strategies to meet the needs of her students and classroom routines. The exploratory case study findings offer practicing educators and teacher educators, alike, helpful suggestions for introducing mobile devices into their classroom and begin a dialogue about the various practices and classroom management implications for a variety of uses of mobile devices in K-6 settings. Ms. G. is walking around her classroom checking on students’ progress on the lesson. Several students are seated in groups of four, each of them tapping away on their new iPad’s. This is a twenty first century 5th grade classroom, in a New Jersey urban school district. They are studying the Civil Rights Movement during their Social Studies lesson, while using an app called Idiary. They are reporting on their thoughts after reading Ruby Bridges, by Robert Coles, following a prompt that appears on the SMART board in the front of the classroom. It is 1:35 pm, the students have just returned from lunch and recess, and are actively engaged in the day’s activity. Ms. G walks around the room asking several students, one at a time, “May I see what you are working on?” Breaking stride, they pause to offer Ms. G. a glimpse of their mobile device and what they are writing. Over the past several decades, technological advances have changed rapidly. In the 1980’s the PC became an almost ubiquitous component in homes across the country. In the 1990’s, electronic communications began to supplement our communications and spawned new discourses such as snail mail, etc. The 2000’s saw a time when all of this technology became somewhat more affordable and accessible across the globe. In 2009, however, another advent took hold of the technological world when the introduction of apple’s iPod, which promised a level of personal connection to electronic devices, previously unparalleled, was released. Each of these technological shifts has raised interesting questions about the nature of teaching and learning. They have also spawned numerous discussions and sometimes debate about how these devices can be utilized in schools to increase teaching, learning, and ultimately school outcomes. There has been no shortage of belief about the positive impact that various technological shifts have afforded educators. In fact, new paradigms about teaching and learning have launched their way into discussions about pedagogy and learning environments specifically. As others have noted, schools have not waited for empirical evidence to support the notion that technology should be included in daily pedagogy. Moreover, states and districts have created enormous per student expenditures in hopes of equipping schools with the latest technological trends. Cuban (2001) famously stated technology is often oversold and underused; pointing to the rapid nature by which technology shifts and the lag time it takes for schools to become actively engaged in the latest trends. Coinciding with the technological shifts and advances we have experienced over the past several decades, there has been a shift in the belief of the nature and role that schools play in the technological innovative cycle. In 1983, Reagan introduced A Nation at Risk, reporting on how our schools are failing to produce a workforce capable of maintaining a forward trajectory with regard to technological innovation. Since that time, technology and public schools have been married to one another. Despite this seismic shift and the shifting role and purpose of schooling, teacher preparation has struggled to keep up with training teachers to effectively use technology and more importantly to change their teaching paradigms to match the new mediums to allow students to benefit as much as possible. This very brief historical discussion is designed to illustrate the rapid nature of change in public schools, specifically surrounding technological advances, and how difficult it is for teachers, lacking the training, possibly the belief, and the skills necessary to change along side these latest trends. Given this political context and nexus of new often politically charged beliefs about teaching and learning, we pause to consider the circumstances by which the introduction of mobile devices could be met with enthusiasm and success. Thus, we ask what does it look like when mobile devices enter the classroom of an early adopter, and how does the teacher adjust their classroom management strategies to match the shift?